You might have seen a magnifying glass. It is used to read very small print . You might have also used it to observe the body parts of a cockroach or an earthworm. The magnifying glass is actually a type of a lens.Lenses are widely used in spectacles, telescopes and microscopes. Try to add a few more uses of lenses to this list. Get some lenses. Touch and feel them. Can you find some difference just by touching? Those lenses which feel thicker in the middle than at the edges are convex lenses. Those which feel thinner in the middle than at the edges are concave lenses. Notice that the lenses are transparent and light can pass through them. Take a convex lens or magnifying glass. Put it in the path of sunrays. Place a sheet of paper as shown. Adjust the distance between the lens and the paper till you get a bright spot on the paper. Hold the lens and the paper in this position for a few minutes. Does the paper begin to burn? 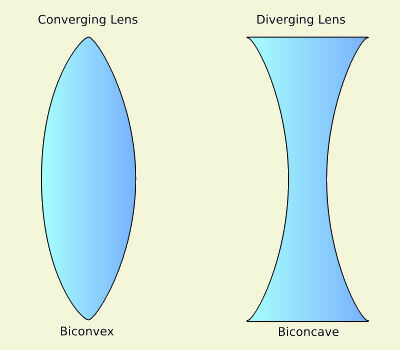 Now replace the convex lens with a concave lens. Do you see a bright spot on the paper this time, too? Why are you not getting a bright spot this time? We have seen in the case of mirrors that for different positions of the object the nature and size of the image change. Is it true for lenses also? Take a convex lens and fix it on a stand as you did with the concave mirror. Place it on a table. Place a lighted candle at a distance of about 50 cm from the lens. 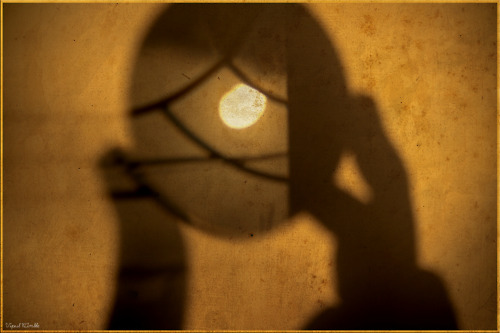 Try to obtain the image of the candle on a paper screen placed on the other side of the lens. 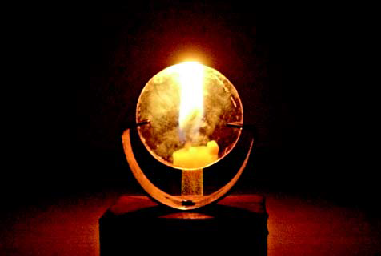 You may have to move the screen towards or away from the lens to get a sharp image of the flame. What kind of image did you get? Is it real or virtual? Now vary the distance of the candle from the lens. 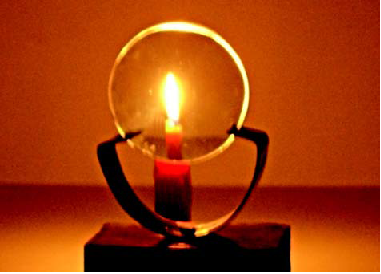 Try to obtain the image of the candle flame every time on the paper screen by moving it. Record your observations as you did for the concave mirror. Did you get in any position of the object an image which was erect and magnified. Could this image be obtained on a screen? Is the image real or virtual? This is how a convex lens is used as a magnifying glass. In a similar fashion study the images formed by a concave lens. You will find that the image formed by a concave lens is always virtual, erect and smaller in size than the object. Sunlight - White Or Coloured ? Have you ever seen a rainbow in the sky? You might have noticed that it appears usually after the rain when the sun is low in the sky. The rainbow is seen as a large arc in the sky with many colours. How many colours are present in a rainbow? When observed carefully, there are seven colours in a rainbow, though it may not be easy to distinguish all of them. These are red, orange, yellow, green, blue, indigo and violet. You might have seen that when you blow soap bubbles, they appear colourful. Similarly, when light is reflected fr om the surface of a Compact Disk (CD), you see many colours. Take a glass prism. Allow a narrow beam of sunlight through a small hole in the window of a dark room to fall on one face of the prism. Let the light coming out of the other face of the prism fall on a white sheet of paper or on a white wall. What do you observe? Do you see colours similar to those in a rainbow? This shows that the sunlight consists of seven colours. The sunlight is said to be white light. This means that the white light consists of seven colours. Try to identify these colours and write their names in your notebook. Can we mix these colours to get white light? Let us try. Take a circular cardboard disc of about 10 cm diameter. Divide this disc into seven segments. Paint the seven rainbow colours on these segments. You can also paste, coloured papers on these segments. Make a small hole at the centre of the disc. Fix the disc loosely on the tip of a refill of a ball pen. Ensure that the disc rotates freely . Rotate the disc in the daylight. When the disc is rotated fast, the colours get mixed together and the disc appears to be whitish. Such a disc is popularly known as Newton'­s disc. A convex lens can form real and inverted image. When the object is placed very close to the lens, the image formed is virtual, erect and magnified. When used to see objects magnified, the convex lens is called a magnifying glass.